Nebraska raises 9 to 10 million acres of corn annually, about 70% of which is glyphosate-resistant and grown primarily in rotation with glyphosate-resistant soybean. Figure 1. Dropped or lost kernels from the combine. These kernels overwinter and germinate in the spring as volunteer corn and compete with the crop grown in rotation. This technology and rotation have improved weed management, except in the case of volunteer corn in soybean. 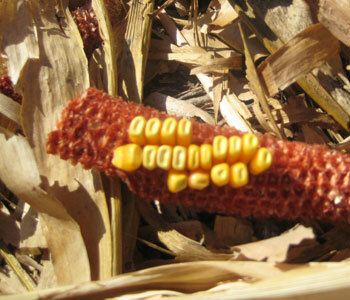 The problem begins during corn harvest when kernels are dropped or lost from the combine (Figure 1). These kernels overwinter, germinate in the spring, and compete with the crop grown in rotation. Volunteer corn in soybean can compete for moisture, nutrients, and light, and drastically reduce yield. Figure 2. A clump of corn will be more competitive than an individual plant. Figure 3. 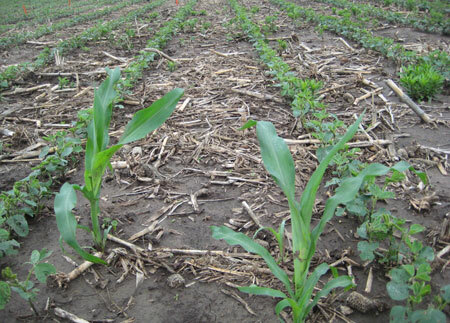 Volunteer corn in soybean competes for moisture, nutrients, and sunlight and can drastically reduce soybean yield. Figure 4. Liberty applied at 29 fl oz/acre controlled volunteer corn in Liberty Link soybean in an experiment conducted at UNL's South Central Ag Lab near Clay Center. Volunteer corn in soybeans can have implications for corn rootworm management, as well as compete with soybeans as a weed. If volunteer corn is not removed before it silks, it can attract rootworm beetles to lay eggs in the soybean field, reducing the value of rotation if the field is planted back to corn next year. Additionally volunteer corn in soybeans after corn may provide a food source for rootworm larvae that hatch out in that field. If the previous year's corn was a Bt rootworm corn hybrid, it is likely that the volunteer corn will express a reduced level of Bt toxin compared to its hybrid parent, potentially selecting for resistance to that Bt toxin. The same scenario may occur with volunteer corn in corn (Krupke et al. 2009). South Dakota State University conducted studies in 2007 and 2008 where they established volunteer corn densities of 0 to 17,800 plants/acre in soybean (Alms et al. 2008). The corn was allowed to compete for the entire growing season before soybean yields were measured. A density of 5,000 volunteers/acre reduced soybean yield approximately 20% — a 12 bu/acre yield loss in 60 bu/acre soybean. With a density of 5,000 plants/acre, there would be a volunteer corn plant every 3.5 feet of row. 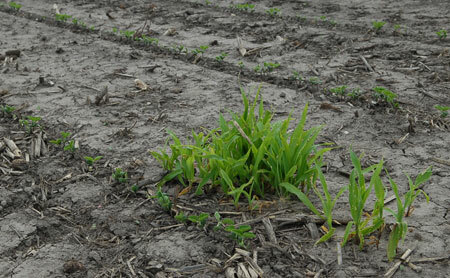 Clumps of volunteer corn plants can reduce yield even more (Figure 2). Researchers in Minnesota (Andersen et al. 1982) and Illinois (Becket and Stoller 1988) conducted studies in the 1980s to measure the effect of clump density on soybean yield. Clumps of corn (7 to 10 plants per clump) were established at different densities. Depending on the location and year, soybean yield was reduced 1% for every 75-115 clumps per acre. Even though all the weeds in a field may be dead at the end of a year, allowing them to grow for a long time along with the crop costs you yield. By delaying the application of the post-emergence grass herbicide from 6-12 inch corn to 12-24 inch corn or taller, higher herbicide rates are required. As a result, the cost of control increases by 50% or more. 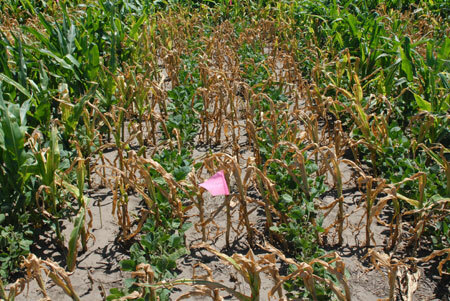 Delaying the post-emergence herbicide application reduces the effectiveness of rotating between corn and soybean by allowing disease and insect pests to survive in the field. In addition, it may jeopardize the insect resistance management strategies that have been adopted by the industry to reduce the risk of corn rootworms from developing resistance to Bt. Several grass herbicides, including Assure II, Fusilade, Fusion, Poast, and Select Max, have been registered in soybean for control of volunteer corn (Table 1). Liberty can be applied for control of volunteer corn, but only in Liberty Link soybean (Figure 4). Grass herbicides can't be used in-crop in a hybrid corn field for control of volunteer corn, so, if volunteer corn pressure is extremely high, consider planting soybean versus corn because soybean has better in-crop herbicide options. Volunteer corn effect on corn and soybean yield. North Central Weed Science Society, J. Alms, M. Moechnig, D. Deneke, D. Vos. 2008. Abstracts Volume 63. Controlling volunteer corn (Zea mays) in soybean (Glycine max) with diclofop and glyphosate. R.N. Andersen, J.H. Ford, W.E Lueschen. 1982. Weed Science 30:132-136. Volunteer corn (Zea mays) interference in soybeans (Glycine max). T.H. Beckett and E.W. Stoller. 1988. Weed Science 36:159-166. Volunteer corn presents new challenges for insect resistance management. C. Krupke, P. Marquardt, W. Johnson, S. Weller, and S.P. Conley. 2009. Agronomy Journal 101:797-799. Table 1. Labeled rates of grass herbicides to control volunteer corn in soybean. * AMS, ammonium sulfate; COC, crop oil concentrate; NIS, non-ionic surfactant.